Alan Munter 08 JULY 1999, converted to Java. This function calculates the scattered intensity for a population of polydisperse spheres, including hard sphere interactions between the particles. The calculation is an exact, multicomponent solution, using the Percus-Yevick closure. A Schulz distribution is used to describe the polydispersity of the diameter. The returned value is the scattered intensity in absolute scale, units of [cm-1]. Since both the form factor and structure factor are included in this calculation, any other structure factor selected in the calculation will not be applied. Polydispersity, p = s/R, where s2 is the variance of the distribution and R is the mean particle radius, Parameter. 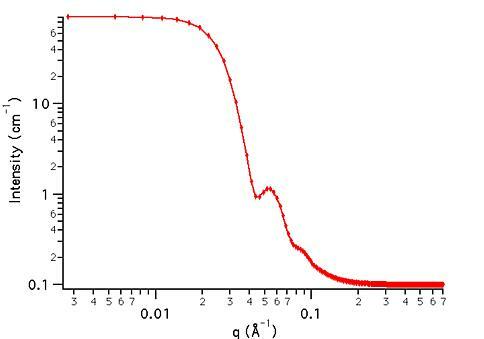 For a more complete description of the Schulz distribution, see: J. Hayter in "Physics of Amphiphiles - Micelles, Vesicles and Microemulsions" V. DeGiorgio and M. Corti, Eds. (1983) p. 69. Polydispersity, Parameter, is constrained during calculation to remain between its physical limits of 0 < p < 1. If a value larger than this is entered the value is quietly converted to 1. Scattering contrast = SLD (sphere) - SLD (solvent). Volume fraction and scattering contrast are correlated, and one or both should be held fixed during model fitting. Griffith, W. L.; Triolo, R.; Compere, A. L. Phys. Rev. A, 1987, 35, 2200. This example dataset is produced by calculating the PolyHardSphere using 256 data points, qmin = 0.001 Å-1, qmax = 0.7 Å-1 and the above default parameter values.